This is a total conversion mod for Age of Empires 2 HD Edition, which takes place in the colonial era. 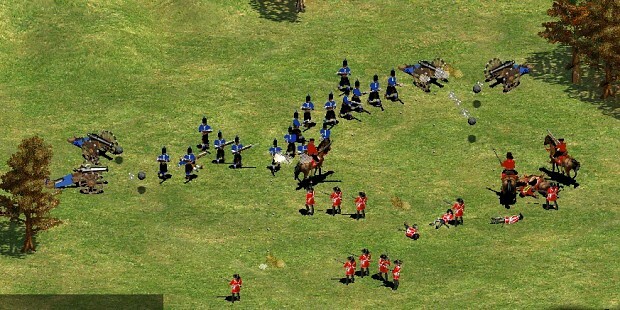 This is not an Age of Empires 3 remake, nor is it simply Age of Empires 2 set in the colonial era. There are new units, buildings, techs, and features which help it better fit into the colonial era. It is for the HD version. In the Independance Age, the North American Colonies, Britan and france, and the Dutch, Germans, and Swedes recieve a more specialized set respectively. Represents events such as the American Revolution, and the War of 1812, when Nations became separate from European Empires. Also represents the era of Napoleon. 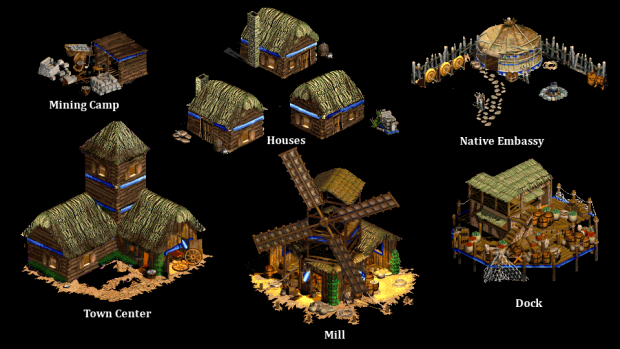 All European and American Civilizations start with an explorer unit similar to the one in Age of Empires 3. All Native American Civilizations begin with a similar, Chief, unit. The Native Embassy is the first buildable military building, replacing the barracks, and trains Native military units. Most of the Portuguese's colonial riches were made off of abusing Indian ocean trade routes, and via the extremely cruel sugar industry. They established relations with African kingdoms to control the slave trade, and conquered Angola and took over Cape Good Hope for the same reasons. The slave trade was very important for the Portuguese, since slaves died faster than they had children, and had to be imported in large quantities. The Portuguese have many economic bonuses for fighting, but few actual military bonuses besides their longer line of sight, which gives them a slight edge in finding villagers. They must raid early to get their economy going too since they start out with the same resources everyone else does. However, once this is overcome, they can become very strong quickly if they can get at their enemies' economy. They also excel at naval wars, if not for sheer force for their economic strength. The Swedish were very religious, and pastors were the main source of both moral support and discipline on campaign- they were taught to be brave, since if God wanted them to die they wouldn't be able to do anything to stop it, so some religious Techs are still required. Military produced 30% faster, but it is weaker. *Note, Aztec, Mayan and Spanish remain mostly the same. Native Rifleman is a stand alone unit availible in the independence age. The Hussar line is available to Europeans. The Dragoon line is available to Europeans. The Elder's Hut is an all new building availible to Natives providing new technologies. And last but not least the Mercenary Hut, a building which trains cultural units. As the mod is not yet complete, any suggestions are very welcome! Hi? someone plays this mod? Whoever warns me :D.
Hello, this is not related to your mod, but I'd like to ask your help for something. Ive been using the Advanced Genie Editor to mod AoE2 HD, but whenever there are updates for the game, all my modifications disappear. How can I mod the game without this happening? Do I need to use another mod tool? I always make frequent backups of all my modded data so when an update comes and replaces the mod files I can replace them with the most up to date version of the mod. You do lose some progress but if you make back ups frequently enough it shouldn't be to bad. How can i put in the game just the musketers and the artillery with Genie editor? 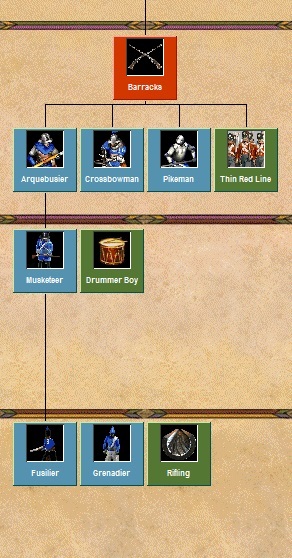 So how can i add texture,siund,and the data in the game to every nation can be swapn this tpe of units ? so please what i have to do ?